Minnie is a crimini mushroom or agaricus bisporus. She is one of Cap’s cousins. She is also Bella’s little sister. 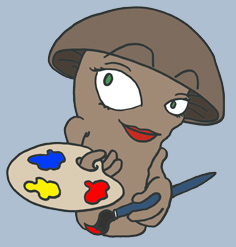 Minnie is very creative and loves to paint. Her favourite thing to paint is outdoor scenery. Minnie is very peaceful, but she does have a competitive spirit when it comes to her favourite sport, soccer. Minnie enjoys taking care of the environment, and hopes that one day she will be a marine biologist.